Thanks for visiting me today. Today is my day to share a project with you as part of the Pinque Peacock Blog Hop! It has been happening all weekend...started on Friday, so if this is the first you heard of it, you might want to start at the beginning to see all the lovely projects the team of artists and creators have to show you! Click on the button above to go the Pinque Peacock blog post for the start of the hop. You will definitely want to participate, because there is a great reward if you do! 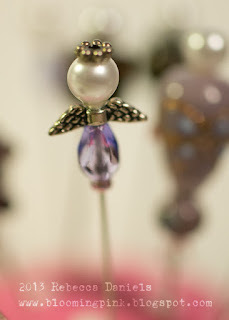 You can find out how to qualify for the gift on the Pinque Peacock blog! I realize my two projects aren't exactly "Irish" or themed to the upcoming St. Patty's Day holiday, but this is where my muse took me. 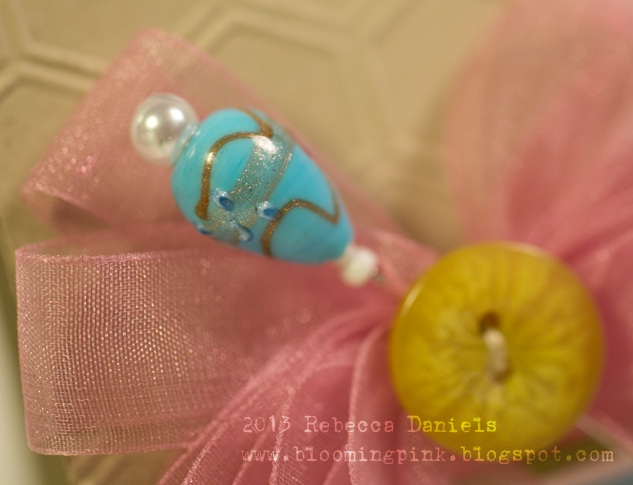 First, my card features one of the Pinque Peacock stick pins. Isn't it lovely? Here's a close-up. And my second project is to hold my Pinque Peacock stick pins and buttons. I made it from a jelly jar, fabric, and pillow stuffing! F A N T A S T I C ... Rebecca! Your projects are awesome and so is your entire post. Way to represent lady! I think my favorite is that fuu fuu bow on your adorable card. Oh how fun! That pin holder is adorable! Thanks for the inspiration..I want to try this! Thank you for sharing! This is awesome Rebecca!! LOVE that pin cushion!! Beautiful card and pun cushion!! I sooo need one of those. VERY VERY CUTE!!! I just love it.... what crative ideals!!! thank you for sharing!!! Im a new Follower!!! wonderful projects! love that honeycomb background and your blog is super cute! Rebecca, your imagination is such an inspiration. 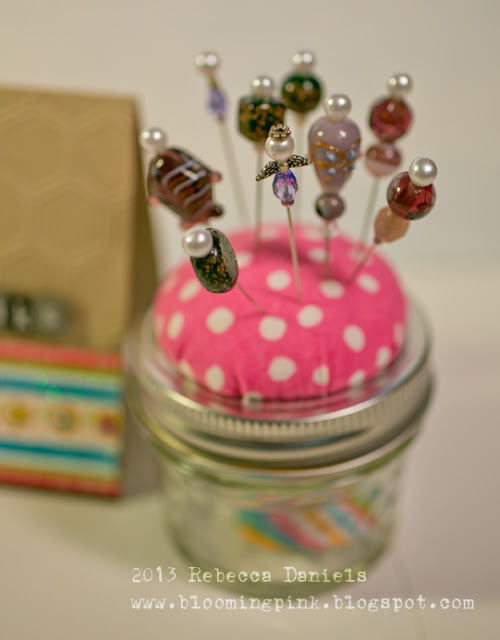 Your card is beautiful and I love the fun jar pin cushion you have created. I feel inspired to make one now. Delightful Projects sweet Blooming Peacock! GORGEOUS!!!!... Love the pin cushion!!! This is beautiful, Bek! I love that pincushion. And, of course, the pins are lovely! Love the card and the pin holder. all things lovely.the card,the pin,the holder. Very pretty card!! I like your stick pins!! Oh I love this card! So pretty and the embossing is great! Such cute projects and love the card!! Cute card, love the pink and turquoise together! Rebecca, we are all going to be making those pink cushions!!! Fab girl!!! oh, and yes your card is purdy!!!! !